Despite having the sweater for a while, I managed to let it get lost in the depths of my closet for way too long. I guess it needed the perfect pairing to make its debut, and the floral jeans filled that void. Since these are my first pair of J Brands, I'm now asking myself why I didn't become a fan earlier. The super soft fabric, medium rise, and well-tailored fit are making a me a newly dedicated fan of the label, which I'll be stalking at stores in the near future. I'm still obsessed with the cropped skinny jeans and heels combination, as it's a refreshing change and welcome diversion from my usual ankle boots. 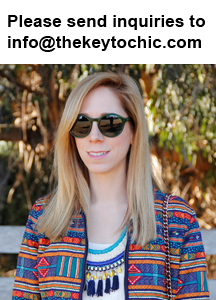 **I recently joined Pinterest, and if you'd like to join me in this new addiction to visual inspiration, you can find me at thekeytochic.